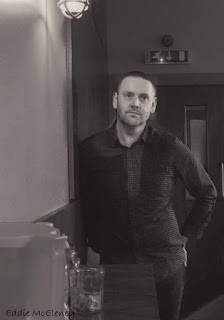 This month's author under the spotlight is another fellow Spotlighter at "Bloody Scotland" - Stephen Watt. Thank you so much for letting me grill you, Stephen! You’re a poet and a spoken word artist. How did you get started in this field? 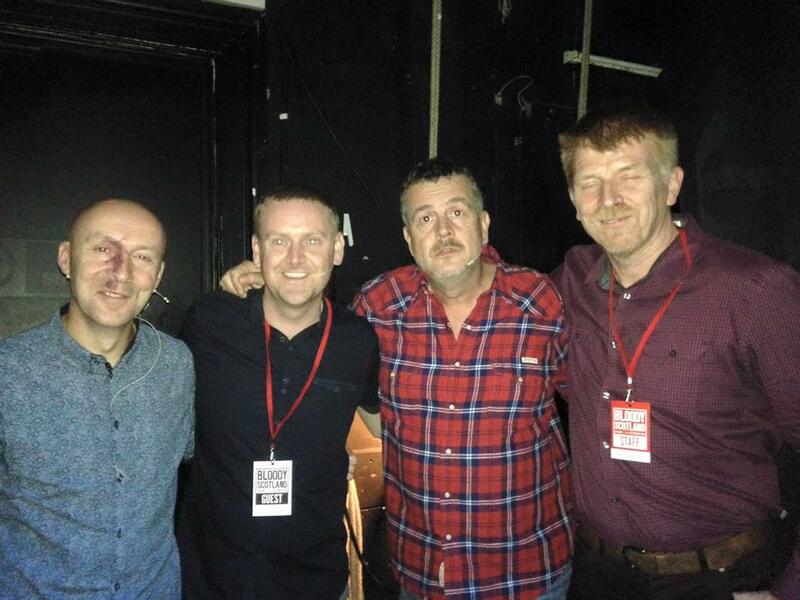 When I was 19 I was mugged twice within six months by drug addicts from Drumchapel and Renton. It shook me up. I never wanted revenge but I wanted to understand what led people to lives where they prey on the vulnerable to feed their habits. It was therapeutic to write poetry at the time – in between counselling sessions – and pick myself back up in a creative way. You’ve won a number of poetry slams, perhaps most notably in 2011 when you beat 8000 others to win the Poetry Rivals Slam in Peterborough. Did that open a lot of doors for you? If so, what? What are your favourite memories from the event? It was my first Slam so I didn’t really know what to expect. I travelled south with a friend with the intention of savouring a bit of poetry and then going out on the piss, having a laugh, do what we do. It completely caught me off-guard that I won the event. We celebrated until nearly 4am that night – such an unbelievable high. I’m sure it did open doors – it put my name out there (I had been performing for just 6 months when I won the Poetry Rivals competition), it earned me a book deal which led to a 100-person attendance in Waterstones, and of course led to a number of book sales which familiarised people with my writing. 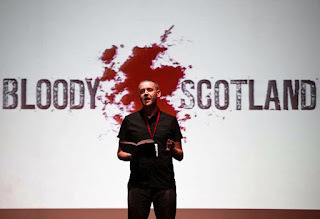 In 2014, you won the Digital Slam award at StAnza, Scotland’s International Poetry Festival. How did that feel? And can we see the winning entry anywhere? The StAnza International Digital Slam was good fun but I take it with a pinch of salt. Gambia and Zimbabwe came 2nd and 3rd respectively and it exhibited some sensational poets. It was great being able to win a slam without having to perform in front of an audience. The poem ‘Rubik’ has served me well and the video which won it was filmed by friends John Paul Lusk (Leven Films) and David Wardrop on a freezing cold January morning. The inflatable sheep in the video was a little nod to my cheeky affection for Aberdeen Football Club and it’s associated with livestock. You’ve had two collections of poetry published – “Spit” and “Optograms”. Firstly, where did the titles for the collections come from? And secondly, what inspires you to write? 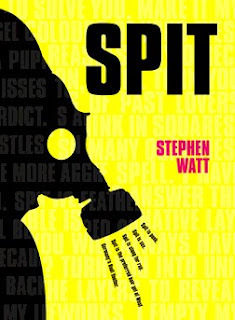 ‘Spit’ was just the perfect word for the things I was writing about – it represented punk (gobbing), it was sexual, it is a term for delivering the oral word/rapping. 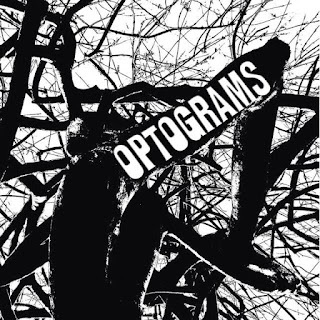 ‘Optograms’ is an image on the retina of an eye used by police in the late 19th century to try capture criminals wherein victims eyes may have “recorded” their killers. The book is a dark noir effort and the title suited the idea of people’s final breaths, last straws, and darkest hours being captured in poetic form. 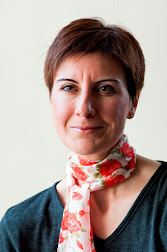 Inspiration comes from real life, reading, and I also worked for the police in intelligence for a decade which led me to my interest in crime writing. You’re also “Poet in Residence” at Dumbarton FC. What does this entail? It entails writing colourfully, passionately, and perceptively about my home town club’s match day programmes and website. It’s a huge honour to be Dumbarton’s first Poet-in-Residence and my aim is to turn people’s perceptions about poetry – and equally – change poetry crowds perceptions about football. Although there are nods and flavours of what happens in the games, often I’m concentrating on the groundsmen, the mascot, the turnstile operators, etc – more about the club than the team. You’re appearing at StAnza on March 2nd (see here for details) for the first time. What will you be doing there? Hopefully delivering a set showcasing the best I have to offer. I have twenty minutes during the Poetry Lunch alongside Katherine McMahon, a fantastic east-coast poet I once performed with in 2013 at the Edinburgh festival, and hopefully not showing myself up. I remain continually bemused that people are interested in what I write and speak about. What was the first poem you ever wrote (I realise this is not necessarily the same as the first you had published)? “Bin Din” – a ‘rubbish’ poem in more ways than one; I heard the bin lorry rumbling down the street and scribbled down a few words about it. If I tell you then I’ll have to kill you! I’ve had a lot of ideas – but at this point, I’m not sure which one is going to take off and fly. There are discussions with Strummerville, the Joe Strummer Foundation about a punk poetry book towards the end of the year. I’m due to be married in the summer so this is probably the quietest I have been, but I still have ‘A Night With Bukowski’ at the Joytown Grand Electric Theatre on 17th March, involvement in the 10 Writers Telling Lies project this early summer, and Stowed Out festival towards the end of August, as well as being involved in the Football Memories book (a book edited by St Johnstone FC Poet-in-Residence Jim Mackintosh), and reviewing/writing articles for punk site Louder Than War and culture hub The Mumble. 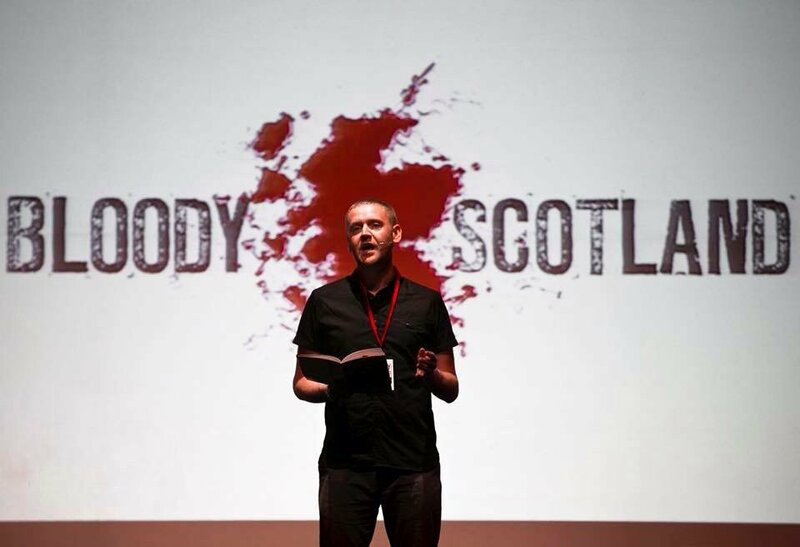 You were one of the “Spotlight on Crime” authors featured in “Bloody Scotland” in 2016. What are your favourite memories from the event? September 2016 may well be my most favourite month of my poetry career so far. The Nutmeg Football Periodical launch in Edinburgh was incredible (attended by Stuart Cosgrove, Ian Rankin, among others), Bloody Scotland in Stirling, and then being appointed Dumbarton’s Poet-in-Residence. BS was just a dream – the rehearsals/meeting fellow Spotlighters at the stunning Albert Hall, invited to the Provost’s Opening Ceremony rubbing shoulders with Stuart McBride, Val McDermid, and Chris Brookmyre on the night he won the William McIlvanney Crime Book of the Year award, chatting with Spotlighters (and subsequently appearing in the background on Reporting Scotland), supporting Chris and Mark Billingham in front of 500 people by reading a couple of my poems, signing books afterwards, the beautiful sun-splitting skies the next morning, the Scotland vs England crime writers football match, meeting Mr Hugh McIlvanney just as I was about to leave Stirling…. It really was just a wonderful event and I’ll always be grateful to Bob McDermid, G.J Brown and Lin Anderson for their warm welcome to the festival – and letting a poet in the door! An old English teacher taught me that during ‘Dulce et Decorum Est’. So true. Hmmmm. Absolute 80s, 90s, or a rock station. Oh that’s a tough one between 1 and 2. Coincidentally, number 3 is entirely about 1’s and 2’s. I’ll opt for 1 – make your own legacy instead of living through someone else’s. Bond, by a country mile. Been a cat man all my life until the last couple of years. Dogs. City with weekend escapes to the country. Biro – it isn’t the pen which makes the writing fancy. Thanks, Amanda – these were great questions! Enjoyed reading this? Why not subscribe to my newsletter? It comes out once a month and subscribers get all my special offers and freebies! No spam, I promise.